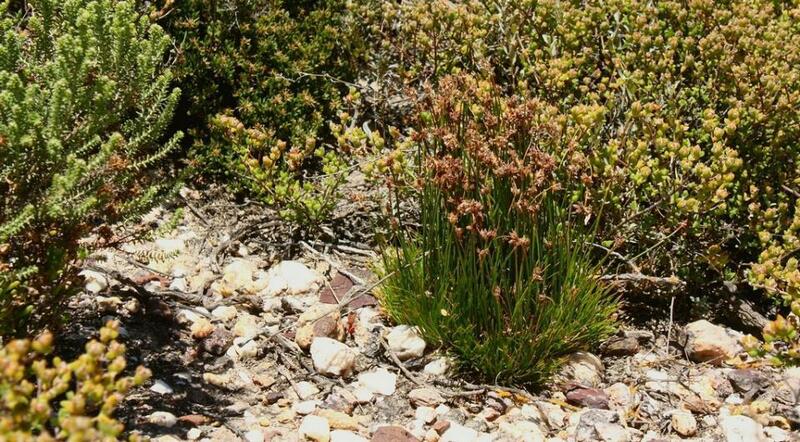 Lowland Renosterveld is the relatively fertile clay-based veld type that occurs in the low-lying areas of the Western Cape, South Africa. 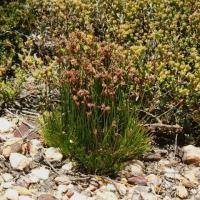 Renosterveld is part of the Fynbos Biome, although it is very distinct from Fynbos. 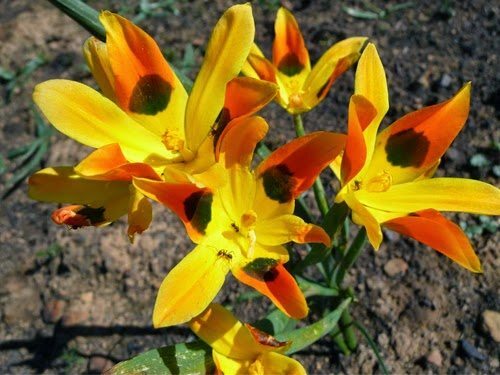 The main difference is that it generally lacks, with some exceptions, the three distinct Fynbos elements, i.e. the Proteas, Ericas (heather) and Restios (reeds). 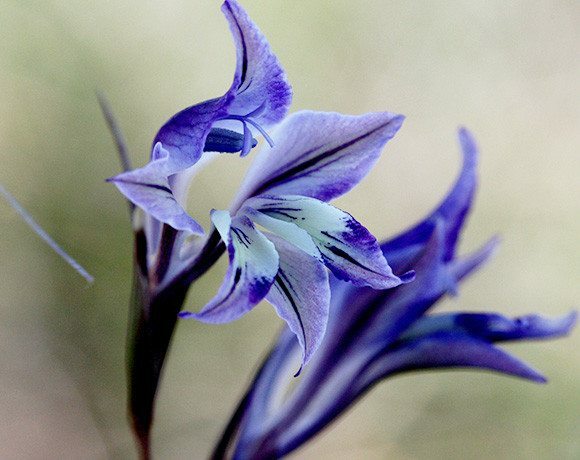 Renosterveld is one of the richest ecosystems in the world, mostly due to its extraordinary bulb diversity. However, the Renosterveld we see today is very different from what it was 300 years ago, before the advent of large-scale commercial agriculture in the Western Cape. 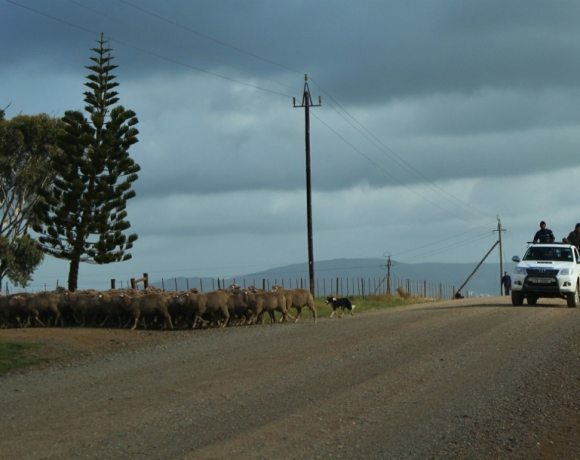 Before European farmers settled in the region, Renosterveld supported large numbers of big game, including Black Rhino, Eland and the now extinct Bluebuck and Quagga. It was also possibly a far more grassy system, with some areas even having a very high Rooigras (Themeda triandra) component, with a much higher plant diversity. The combination of grazing and browsing game animals of varying sizes maintained the diversity and structure of this system. 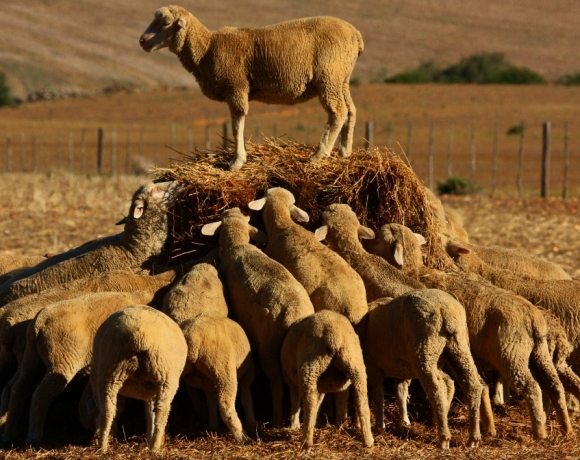 Sadly, the replacement of large game animals with small selective feeders, such as cattle and sheep, combined with years of poorly-informed management (i.e. over-grazing and too little or too much burning) has allowed extensive areas of this special veld to become severely degraded and dominated by ‘unwanted’ shrubs, such as Renosterbos (Elytropappus rhinocerotis). 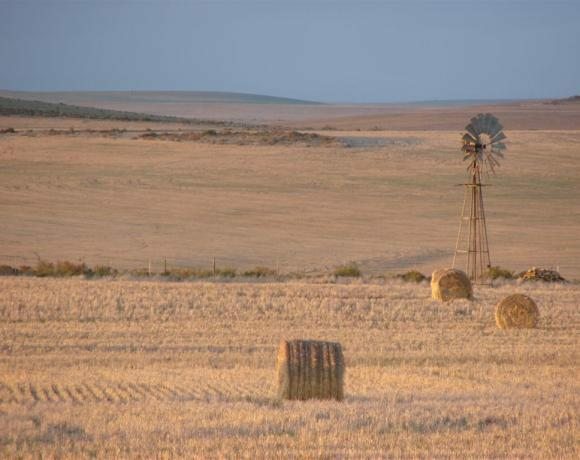 The grey, ‘drab’ veld that we see today is probably largely a result of the legacy of historic overgrazing and is NOT representative of true Renosterveld. Today, those areas that are well-managed retain the characteristics of Renosterveld and it is clear that this habitat supports a diversity of botanical gems, incomparable with any other system in the world. See our Renosterveld library for more articles on the history of Renosterveld and the ongoing debates around what Renosterveld actually is. 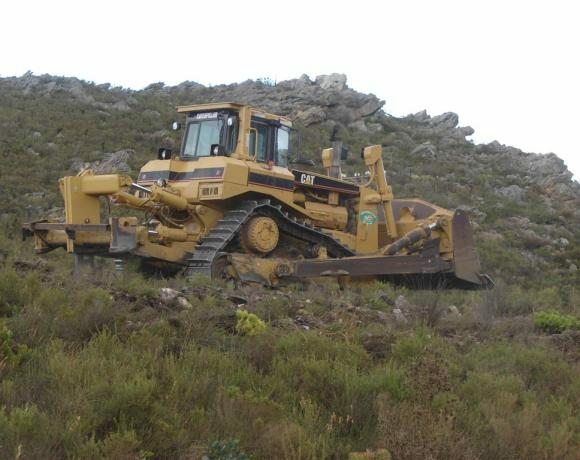 Not only has Renosterveld been altered by management, it has also been severely fragmented for agricultural development. 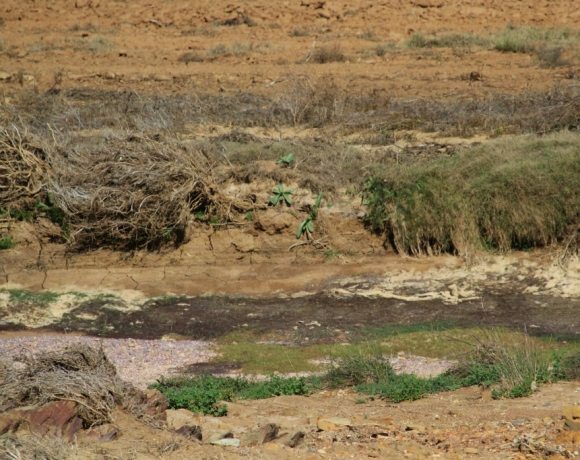 The result is that over 95% has been irreversibly converted to croplands, rendering what remains of this vegetation type in urgent need of conservation attention. Despite these incredibly high levels of threat, Renosterveld has retained an extraordinary diversity and the ORCT was instrumental in discovering six new species in 2012 (see photos below – from left to right Otholobium curtisiae, Polhillia curtisiae, Ficinia overbergensis, Aspalathus quartzicola, Hesperantha kiaratayloriae, and Aspalathus microlithica). 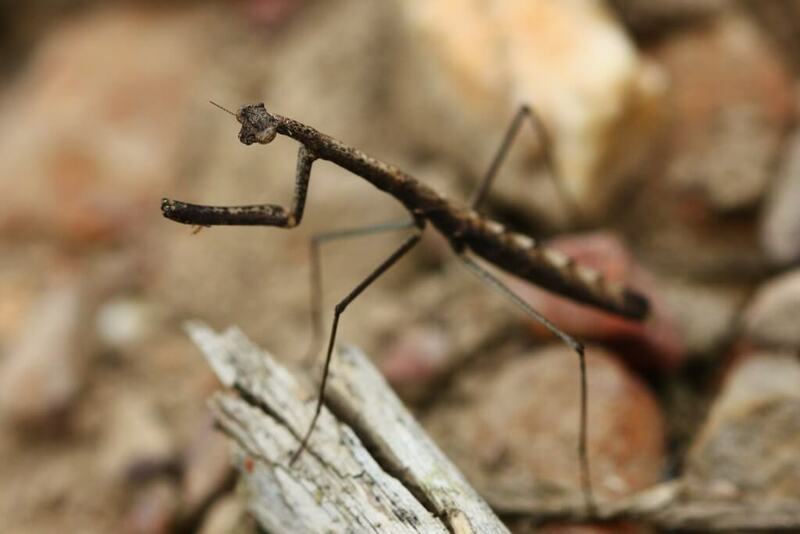 These discoveries, along with the countless records of rare, endemic and threatened species are testament to the importance and biodiversity value of this overlooked and under-valued habitat. The Fynbos Biome comprises more than 120 different vegetation types, emphasizing the high levels of diversity within this incredible biome (see map below). 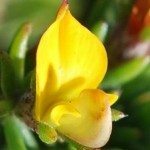 There are four different types of Renosterveld in the Overberg – all of which are equally threatened: Western-, Central- and Eastern-Rûens Shale Renosterveld and Rûens Silcrete Renosterveld. 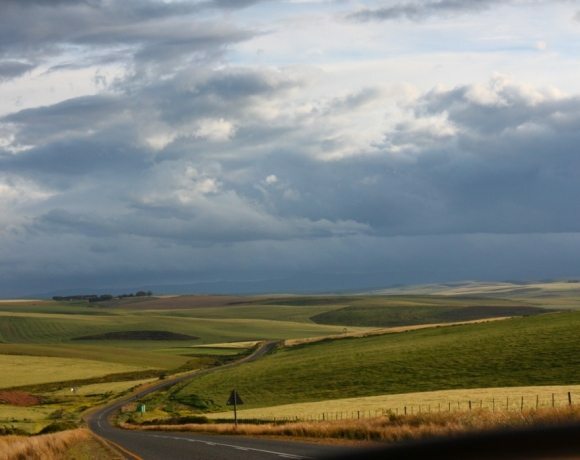 The word ‘rûens’ comes from the Dutch word ‘ruggens,’ which was used to describe the hilly nature of the low-lying, clay-based areas of the Overberg. Today, the ‘rûens’ comprise mostly croplands and Renosterveld remnants. 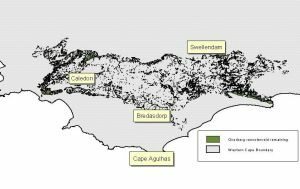 Other threatened lowland habitats in the Overberg include Elim Ferricrete Fynbos, Greyton Shale Fynbos and Swellendam Silcrete Fynbos. 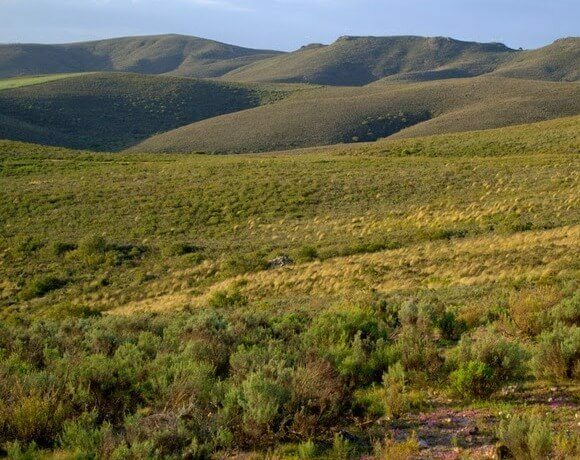 The Overberg Renosterveld Conservation Trust will focus primarily on the Renosterveld habitats to begin with, but is equally concerned with the latter three vegetation types and will also be developing projects within these habitats, once resources become available. 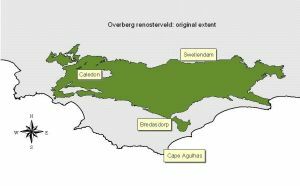 Renosterveld originally covered the entire clay-/shale-based lowlands of the Overberg (see map below on left). These comprise the most fertile soils of the region and so were first identified as being most suitable for agriculture by early European settlers. It is uncertain what exactly these habitats looked like in the past, as they were radically transformed (through livestock grazing and subsequent ploughing) relatively soon after European settlement. 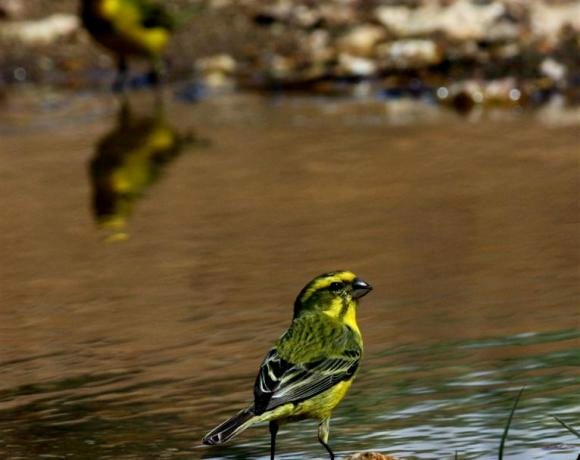 Adjacent to these habitats are the mountainous and strandveld-type habitats, which are generally based on poor and acid soils and are less transformed than their Renosterveld counterparts. 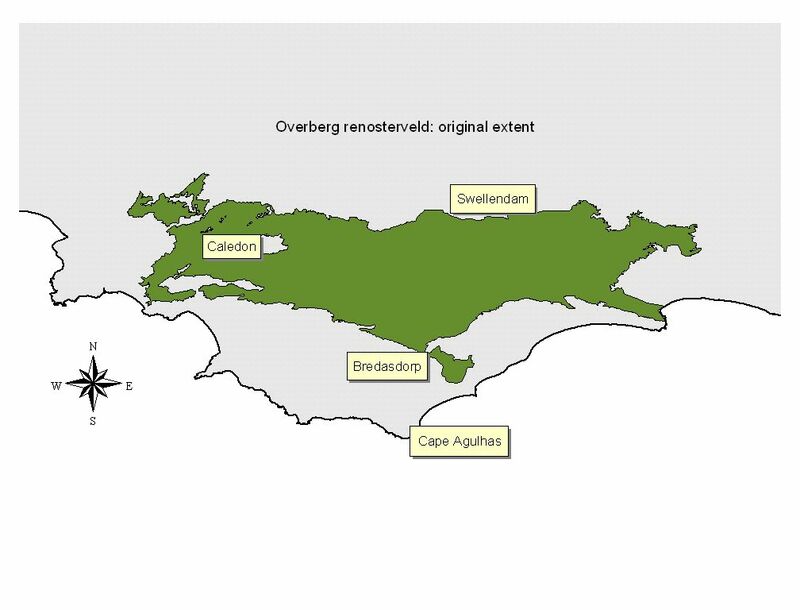 The map below on the right shows that there is around 5% of the original Renosterveld left within the Overberg. Too little fire, too much fire or burning at an inappropriate time. 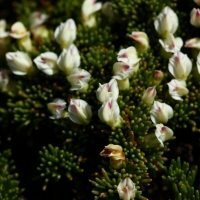 In the Overberg, all four types of Renosterveld, Western-, Central-, and Eastern-Rûens Shale Renosterveld, and Rûens Silcrete Renosterveld, are categorised as CRITICALLY ENDANGERED. 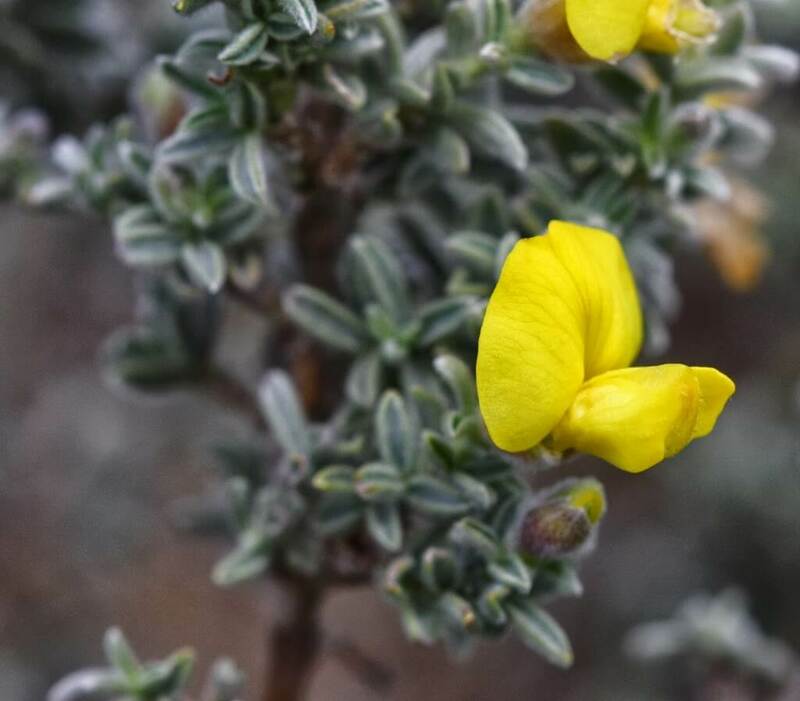 Renosterveld contains many endemic species, which are naturally rare and have highly restricted ranges. 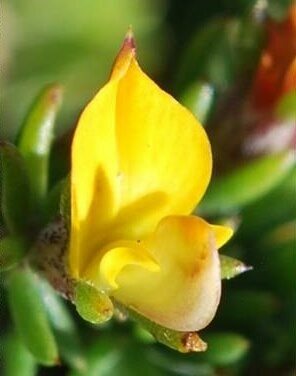 Some of these species are so specialized that they are only found in certain microhabitats, within a certain Renosterveld type. 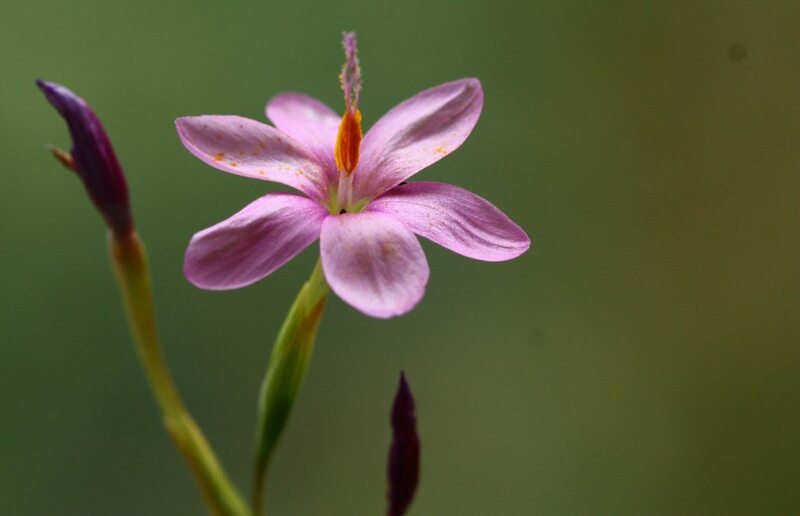 For example, Gibbaeum haaglenii is an Endangered succulent, which only occurs on quartz koppies in Eastern Rûens Shale Renosterveld, while Gladiolus acuminatus is an Endangered bulb which only occurs on north- and northwest-facing Renosterveld slopes between Caledon and Bredasdorp. 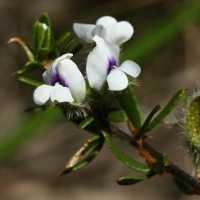 Therefore, a small amount of habitat loss can be detrimental for many of these rare and specialized plants. 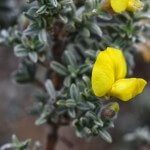 It follows that habitat losses of 80% and more have resulted in many Renosterveld species falling into the higher threat categories. We are dealing with extraordinarily fragile systems that need to be carefully managed and protected if future generations are to enjoy their hidden treasures. The IUCN (International Union for the Conservation of Nature and Natural Resources), which is the world’s authority on the conservation status of species, developed the first Red Data lists in 1948. 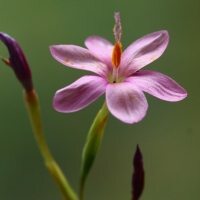 These lists are the most comprehensive inventory of the world’s threatened plants and animal species. 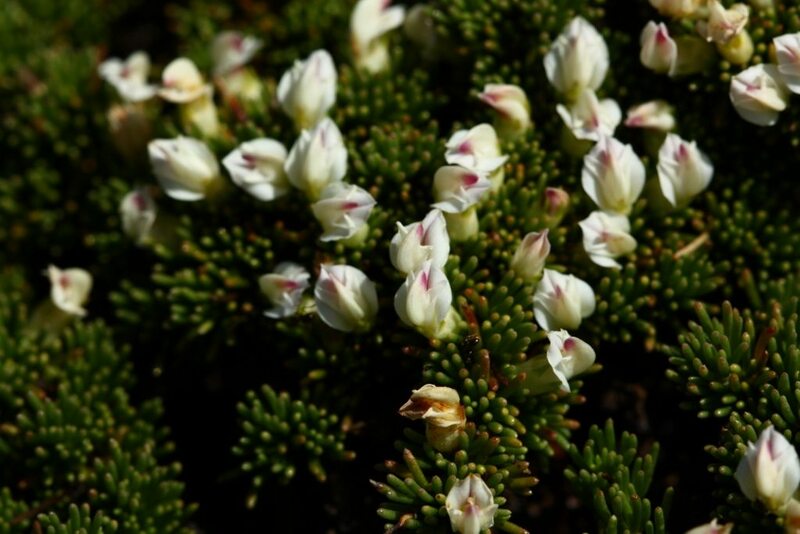 More recently, a group of expert botanists compiled the Red List of South African Plants, which assesses the conservation status of ALL the plants in South Africa – an incredible 20,456 species, of which 13,265 are endemic, i.e. only found in South Africa. Thus, every plant in the entire country’s plant kingdom has been classified according to its threat status. 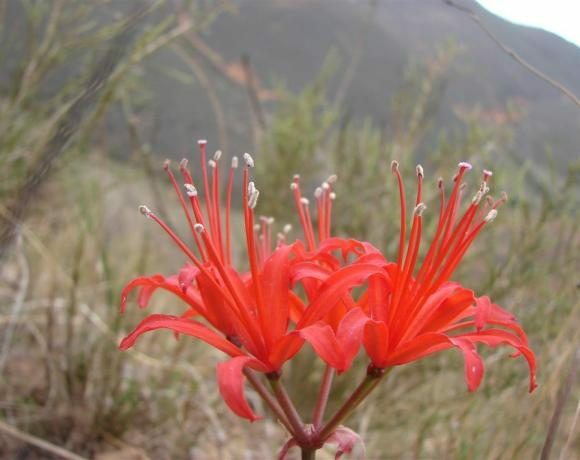 In addition to categorizing plants into their Red Data Category, the list also describes the reasons for population decline and current threats to the species. The Red Listing for VELD TYPES is based on very similar categories and takes into account the percentage of the original extent remaining, as well as current threats to the system. These threat categories are determined by the Department of Environmental Affairs (National Environmental Management: Biodiversity Act, 2004 (Act No. 10 of 2004)).